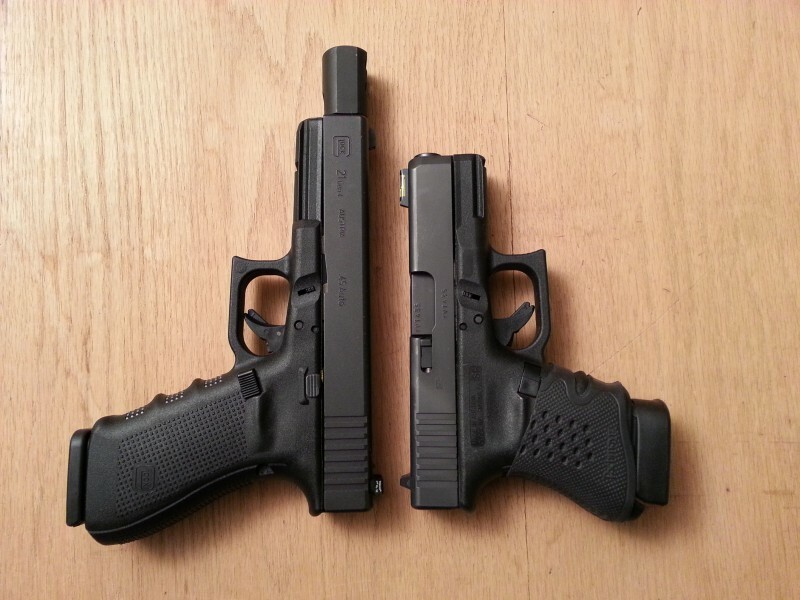 Reprise: Is Muzzle Energy Really a Measure of Handgun Effectiveness? Prompted by my friends over at the Liberal Gun Club, this is another in an occasional series of revisiting some of my old articles which had been published elsewhere over the years, perhaps lightly edited or updated with my current thoughts on the topic discussed. This is an article I wrote for Guns.com, and it originally ran 2/13/2012. Some additional observations at the end. Would you rather be shot with a modern, Jacketed Hollow Point bullet from a .32 ACP or have someone throw a baseball at you? Seems like a silly question, doesn’t it? But did you know that the ‘muzzle energy’ of the two is about the same? Seriously, it is and that’s just one reason why trying to use muzzle energy as a measurement of handgun effectiveness is problematic. Muzzle energy is the kinetic energy of a bullet as it is expelled from the muzzle of a firearm. It is often used as a rough indication of the destructive potential of a given firearm or load. The heavier the bullet and the faster it moves, the higher its muzzle energy and the more damage it will do. Doing the actual calculations can be a bit of a pain, since you have to convert everything into consistent units, but the formula is there on the Wikipedia page (and can be found elsewhere) if you want to give it a go. Fortunately, there are a number of websites out there which will calculate muzzle energy for you – you just plug in the relevant numbers and out comes the result. We also have muzzle energy graphs for all the calibers/ammunition tested at BBTI. If you go through and check all the muzzle energy numbers for handguns with a 6″ or less barrel which we’ve tested (BBTI that is), in .22, .25. or .32, you’ll see that all except one (and you’ll have to go to the site to see which one it is) comes in under 111 foot-pounds. Why did I choose that number? Because that would be the kinetic energy of a baseball thrown at 100 mph. Check my numbers: a standard baseball weighs 5.25 ounces, which is about 2,315 grains. 100 mph is about 147 fps. That means the kinetic energy of a baseball thrown at 100 mph is 111 ft-lbs. Now, we’re not all pro baseball pitchers. And I really wouldn’t want to just stand there and let someone throw a baseball at me. But I would much rather risk a broken bone or a concussion over the damage that even a small caliber handgun would do. And therein lies the problem with using muzzle energy as the defining standard to measure effectiveness: it doesn’t really tell you anything about penetration. A baseball is large enough that even in the hands of Justin Verlander it’s not going to penetrate my chest and poke a hole in my heart or some other vital organ. If I catch one to the head, it may well break facial bones or even crack my skull, but I’d have a pretty good chance of surviving it. Now, I think muzzle energy is a useful measure of how much power a given handgun has. That’s why we have it available for all the testing we’ve done on BBTI. But it is just one tool, and has to be taken into consideration with other relevant measures in order to decide the effectiveness of a given gun or caliber/cartridge. Like measures such as depth of penetration. And temporary and permanent wound channels. And accuracy in the hands of the shooter. And ease of follow-up shots. And ease of carry. I’ve seen any number of schemes people have come up with to try and quantify all the different factors so that you can objectively determine the “best” handgun for self defense. Some are interesting, but I think they all miss the point that it is an inherently subjective matter, where each individual has to weigh their own different needs and abilities. Sure, muzzle energy is a factor to consider. But I think the old adage of “location (where a bullet hits) is king, and penetration is queen” sums it up nicely. In the five years since I wrote that, my thinking has evolved somewhat. Well, perhaps it is better to say that it has ‘expanded’. I still agree with everything above, but I’m now even more inclined to go with a relatively heavy bullet for penetration over impressive ME numbers. I think that comes from shooting a number of different brands of ammo where the manufacturer has chosen to go with a very fast, but very light bullet to get an amazing ME, with the argument that this is more likely to cause some kind of terminal shock, citing tests showing significant ‘temporary wound channels’ and such in ballistic gel. Kinetic energy does not wound. Temporary cavity does not wound. The much discussed “shock” of bullet impact is a fable and “knock down” power is a myth. The critical element is penetration. The bullet must pass through the large, blood bearing organs and be of sufficient diameter to promote rapid bleeding. Penetration less than 12 inches is too little, and, in the words of two of the participants in the1987 Wound Ballistics Workshop, “too little penetration will get you killed.” Given desirable and reliable penetration, the only way to increase bullet effectiveness is to increase the severity of the wound by increasing the size of hole made by the bullet. Any bullet which will not penetrate through vital organs from less than optimal angles is not acceptable. Of those that will penetrate, the edge is always with the bigger bullet. Now, you can still argue over the relative merits of the size of the bullet, and whether a 9mm or a .45 is more effective. You can argue about trade-offs between recoil & round count. About this or that bullet design. Those are all completely valid factors to consider from everything I have seen and learned about ballistics, and there’s plenty of room for debate. But me, I want to make sure that at the very minimum, the defensive ammo I carry will 1) penetrate and 2) expand reliably when shot out of my gun. And if you can’t demonstrate that in ballistic gel tests, I don’t care how impressive the velocity of the ammo is or how big the temporary wound cavity is. So I’ll stick with my ‘standard for caliber’ weight bullets, thanks. Now, if I can drive those faster and still maintain control of my defensive gun, then I will do so. 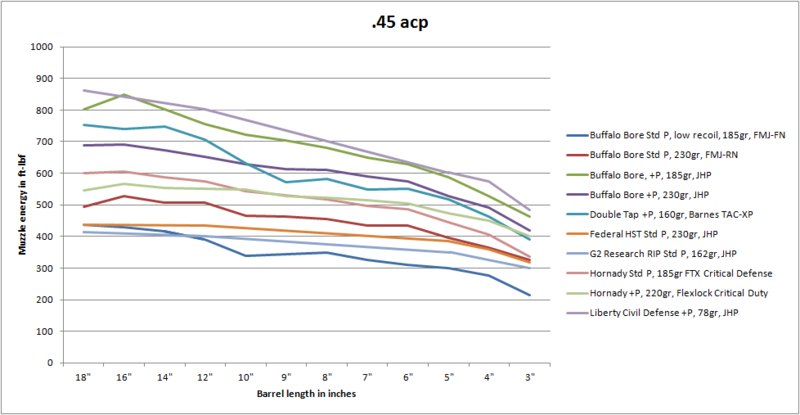 Because, yeah, some Muzzle Energy curves are better than others. Remember this graph comparing Muzzle Energy (ME)? See what I see? 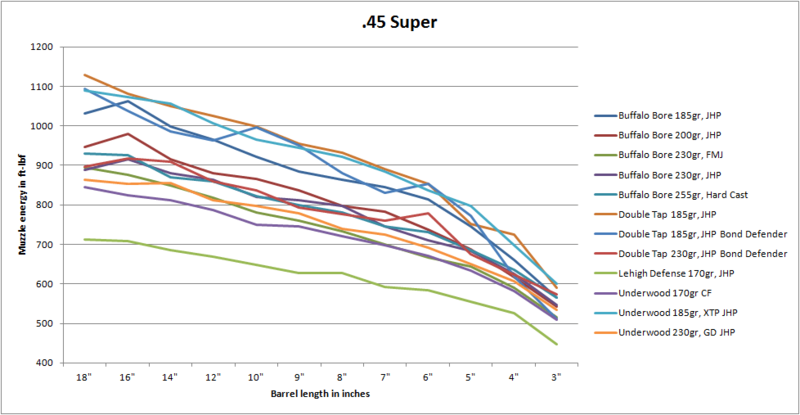 Yeah, at 3″ and 4″ all the .45 Super loads are superior in terms of ME over all the other cartridges in the top graph. At 5″ the .357 Mag catches up with some of the .45 Super loads, and at 6″ it is in the center of the pack. To really do the comparison right, I’d need to average all the .45 Super loads, then add them directly to the first graph, but that’s more time and trouble than I want to take. But my point is that of all the ‘conventional’ CCW-caliber/size guns, it looks like the .45 Super is at the top of the pile. We did formal testing of just one .460 Rowland, and it is comparable to the .45 Super at those barrel lengths (though I know from informal testing that some other loads are more powerful). You have to step up to full .44 Mag to beat either the .357 Mag or .45 Super.